The first instinct of every new parent is to do anything and everything to protect their child and provide them with the best things in life. It’s an instinct as old as time. It’s no secret that the ultimate way to provide nutrition for your baby is to breastfeed, but there are many reasons why that is not an option for parents. There are so many options on the market, choosing the one that will work the best can be quite a process. Formulas are not all created equal. Although they are all required to meet strict nutritional guidelines, there are many variables that set each brand apart. Today, we will be providing new parents with an in depth review of some of the most popular and highly recommended formulas on the market. We will detail all ingredients including specialty blends to help you make the best choice for your little angel. When trying to decide which formula is the best option for your baby, having all the facts can make things easier. There are many building blocks that go into the construction of infant formula. Get to know the main ingredients, the available feeding styles and the added nutrients that make up many available options. Why we like it: It’s the #1 brand used by pediatric doctors and hospitals in the U.S. and is the closest recipe to natural breast milk. The Enfamil name brand is among the highest rated and most widely trusted provider of baby formulas in the world. They use nutritional science to provide the very best formulas for infants. The Stage 1 A+ Infant formula is formulated to give the ultimate in nutrition for the first six months of their lives. This formula is widely available online and in stores so there is no risk of availability issues that come with other brands. It comes in the highest number of various feeding methods including Nursettes, Ready To Use, Powder and Liquid Concentrate. The A+ line contains dual probiotics to ensure smooth sailing for the sensitive digestive tracts of infants. Choline and DHA are added to assist in proper brain and eye development. Added fibers and Polydextrose provide an enriched formula that aids in breakdown of the formula and softens the stool for happier and less fussy babies. The powder comes in environmentally friendly, cardboard and tin cans that are easy to stack for storage. There is no need to keep the powder formula cool and take up precious space in your fridge. The can comes with it’s own specifically sized scoop that can be used over and over. It is safe to store in your pantry at room temperature and has an average shelf life of nearly two years. Why we like it: Specially formulated with Comfort Proteins to be extra gentle on sensitive tummies. Babies only start using their own digestive systems after they are born. Prior to birth they are solely reliant on the umbilicus to provide them with their nutrients straight from their mother. After babies are born, it can take some a little while to adapt to eating differently. Some time is required to allow the digestive system to adapt. It can take some time for the proper bacteria to accumulate in the digestive tract causing some sensitivity to some formulas. 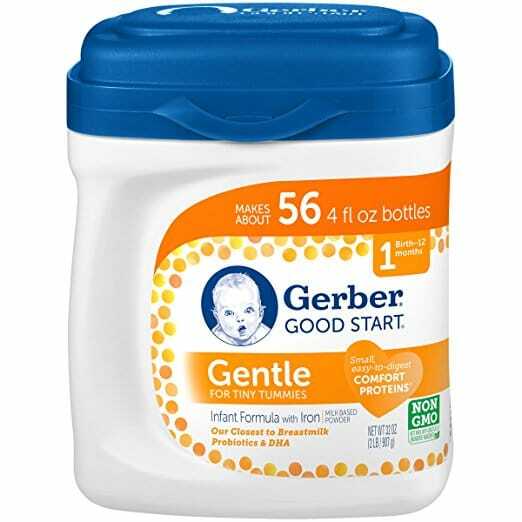 Gerber Good Start Gentle Powder is specially engineered to protect sensitive stomachs from any harsh ingredients that may be irritating. Gerber uses their patented Comfort Proteins that have been broken down to help ease the digestion process. Smaller particles are easier for the new digestive systems of infants to digest making them less fussy and unhappy. This formula is closely modeled after natural breast milk. It is the only one that has DHA, Pre and Probiotics as well as Antioxidants to aid in the breakdown of protein. The formula is milk based and is formulated using only Non-GMO ingredients. There is no strong odor with this product that is commonly found in other powder formulas. Sometimes a strong odor from a formula can translate to the taste causing your baby to reject it. 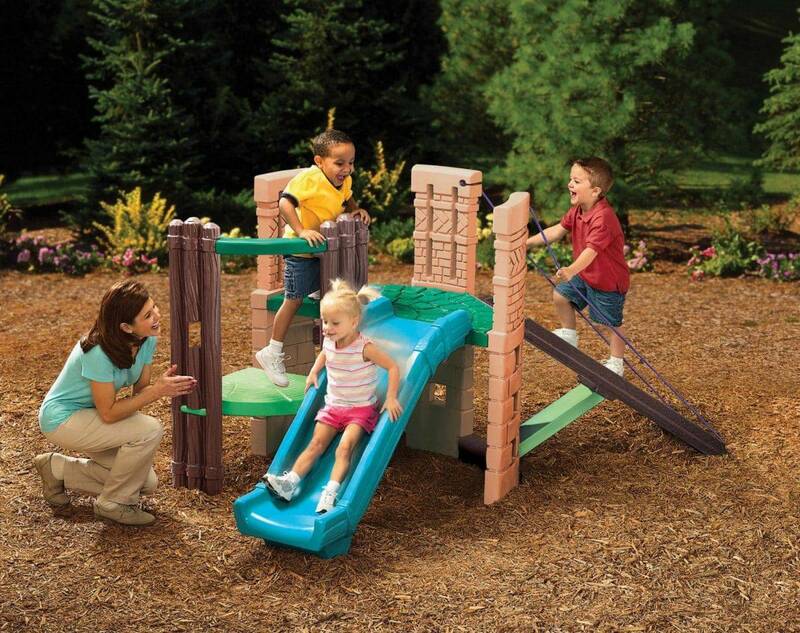 It is suitable for infants from birth to 12 months without having to change up a level. It can greatly reduce the amount of spit up accidents during feedings. This helps ensure that your baby is getting the proper amount of nutrition and not wearing most of a bottle on their bibs. Why we like it: Uses only Non-GMO ingredients to address lactose sensitivity issues with your newborn. Great for easy digestion and happy babies. 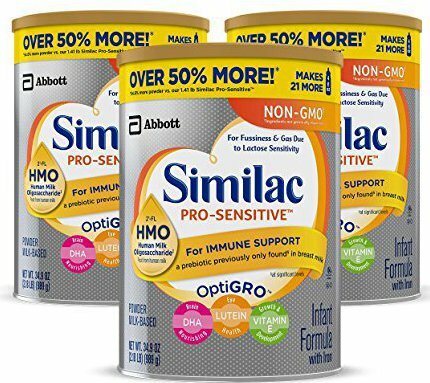 This Similac Pro- Sensitive formula is the only product on the market that has 2’-FL Human Milk Oligosaccharide (HMO). This is a prebiotic that helps to boost the immune systems of infants and could only be found in breast milk. This allows some of the immunity function gaps between formulas and breastmilk to become much smaller. Many parents are hesitant when they find they need to use formula with their babies. Whether you are unable to breastfeed or are going through the transition that comes with going back to work, this formula can help make things go a lot smoother. All ingredients in this formula are strictly Non-GMO and include no trace of artificial growth hormones. Formulated with the Similac patented Optigrow ingredients of DHA, Lutein and Vitamin E. Supporting brain, eye and rapid cell development. This milk based infant formula is specifically designed to address issues of lactose intolerance in infants. By breaking up the lactose proteins into tiny particles it makes it much easier to digest without a harsh reaction. It is not for use for children or babies with Galactosemia. Found to reduce the occurrence of feeding time spit ups, this formula helps babies improve their tolerance for lactose products and is gentle on their stomachs. Less mess equals more food staying in your baby’s tummy. This is the #1 brand that is recommended by Moms. It comes in a choice of plastic refillable container or a classic cardboard and tin can. Both options have a convenient scoop holder on the outside so the scoop doesn’t have to be put back into the powder. Why we like it: Affordable option from a trusted brand to manage cow’s milk allergies that can cause Colic and fussiness in your baby. This Nutramigen formula is highly hydrolyzed and hypoallergenic to help reduce the symptoms of Colic in less than 24 hours. The cow milk protein is broken down to such small particles that it will no longer be recognized by the immune system prompting an allergic reaction. The smaller proteins also help the developing and sensitive digestive system process the nutrients without a struggle. Babies that have used this formula have been found to have much fewer allergies later in their childhood. 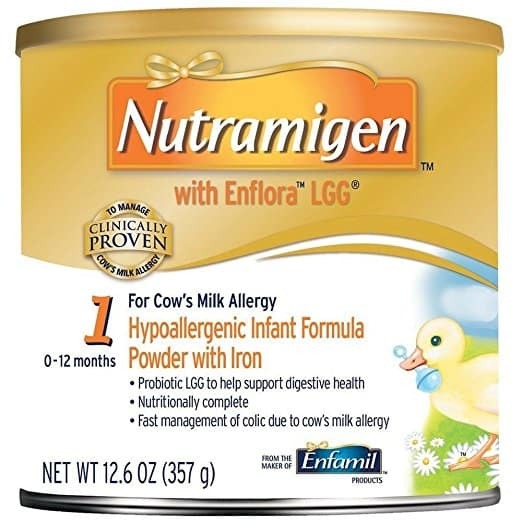 Enflora LLG or Lactobacillus Rhamnosus CG is a specialized bacteria that can allow cow milk toleration sooner in babies that have had allergic reaction. This formula recipe is available for children from infants to toddlers to help maintain consistency in their diet. In the aid of proper brain and eye development, Nutramigen contains DHA and ARA which are Omega 3/6 fatty acids that are essential in promoting healthy growth. Fortified with Iron, the Nutramigen formula promotes strong bone health and development in your growing baby. Shown to quickly eliminate fussiness and gas in most infants, this formula comes in powder, Ready to Use and Concentrat formats for convenient meal times. This is the most doctor recommended formula treatment for infant allergy management.It can also treat other symptoms of allergic reaction including eczema rashes. Why we like it: Currently the only formula that Contains Probiotic L.Reuteri that aids in proper digestion and the breakdown of proteins. The Gerber Good Start Soothe formula can significantly reduce crying and fussiness in babies following feeding time. The gentle formula helps eliminate the build up of gas in the system keeping babies more comfortable. Although it is not specifically designed for allergy treatment, it can help reduce the symptoms of Colic up to 50% while still providing proper levels of nutrition. When infants are born their digestive tracts are still developing and can need a bit of help. The addition of the probiotic L. Reuteri to this formula helps introduce healthy bacterias into the digestive system. Doctor recommended levels of DHA, a vital Omega 3 fatty acid found naturally in breast milk are part of this specialized formula. DHA is recognized as an important part of proper brain and eye development. 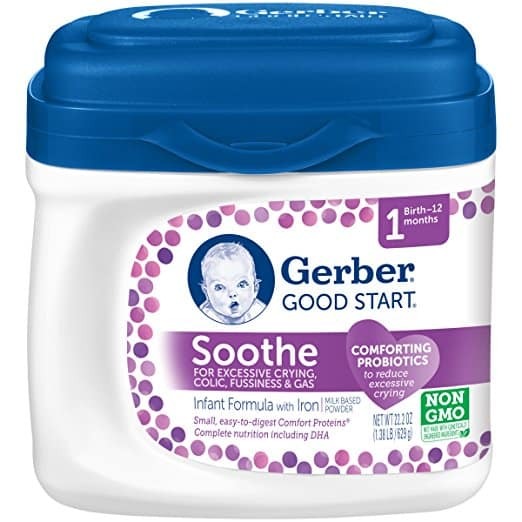 The Non-GMO ingredients in this formula that help to soothe sensitive tummies include Gerber’s Comfort Proteins. The Comfort protein combinations are broken down to a smaller sizes that are much easier for an infant to digest. Fussiness and crankiness often come from the stress of slow or painful digestion. The carbohydrate rich blend is specially formulated with only 30% lactose. For babies that have shown lactose intolerance or allergies, this lower level can help them to process the formula much easier. Why we like it: One of the few Kosher organic formula options that provides excellent levels of nutrition with Organic ingredients. 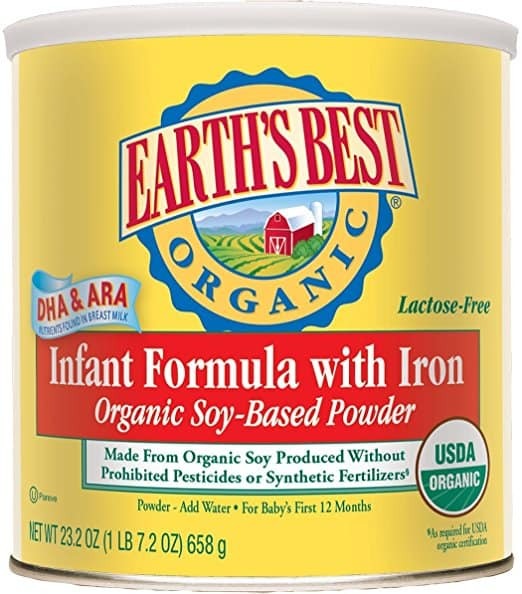 The Earth’s Best Organic Soy formula is easy to digest and is formulated after natural breast milk. It is nutritionally complete and complies with all FDA requirements and is suitable for infants from birth to 12 months. This soy-based formula is enriched with iron and completely lactose free and gentle on fussy stomachs. Lactose intolerance in infants is what generally causes gas build up resulting in unhappy and fussy babies. It is a great option for babies with allergies while still providing maximum nutrition. For parents that wish to promote a vegan diet to their infants, this is an excellent option. It contains 2x’s the level of DHA fatty acids that is found in other milk based formulas. The high amount of this quality protein will help ensure the proper development of the brain and eyes. This formulas is certified by the USDA to contain only the highest quality and inspected organic ingredients. There are no artificial colors, preservatives, GEI, pesticides or herbicides in any parts of the contents. This ensures that parents are only giving their baby the best the earth can offer. It has been shown that this lactose free formula can help reduce eczema as well as colic caused by allergic reactions to milk products. Keeping your baby free of gas and much more comfortable and happy after feedings is important to the comfort of the whole family. Why we like it: The #1 doctor recommended formula for the the treatment of allergies and colic. 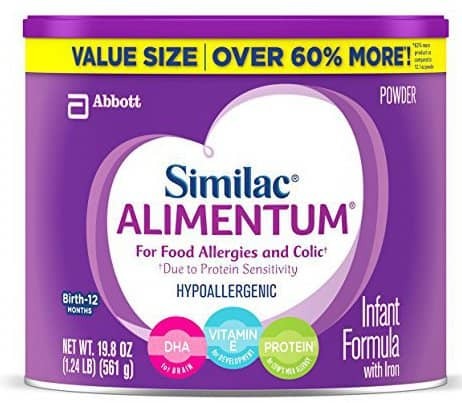 Similac Alimentum is a hypoallergenic and lactose free formula option for babies that are suffering from allergies to cow’s milk. While still providing excellent nutrition to your baby, the lactose free formula will calm your baby’s gas, fussiness and eczema symptoms within 24 hours. Keeping babies happier and letting parents get a little well deserved rest. This fortified formula has added iron and is Omega rich with DHA and ARA proteins that help aid in normal organ, brain and bone development. There is no need for parents to be concerned that this formula for allergies is lacking in any nutrition for their babies. Although it is lactose free, the Similac Alimentum formula contains a milk protein that is vigorously broken down to the tiniest particles. The proteins are so small that they can eliminate any allergic reactions for babies that are intolerant to cow’s milk. THe formula recipe contains no palm olein oil and is corn product free. This gluten free formula is available in powder or Ready To Use formats for convenience at feeding time. The larger size packaging can provide you with 60% more 6 oz bottles than with most formulas, making it last longer with fewer trips to the grocery store. Because the Similac brand name is known around the world, you will not have any problems picking up your formula at any store or online. Why we like it: USDA Certified Organic formula that provides the highest quality in full nutrition for your baby through it’s first full year. 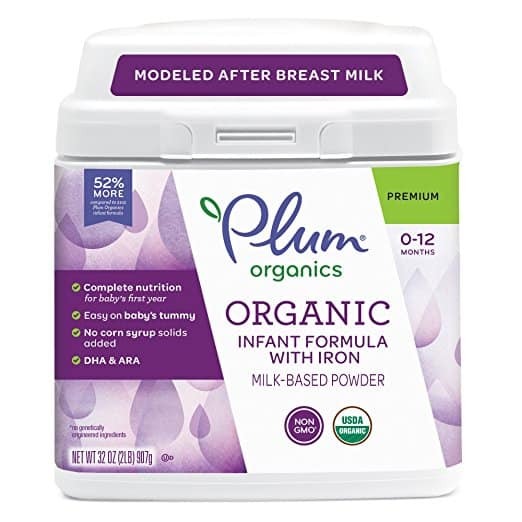 Plum Organics is a company that is dedicated to providing only quality products that are as closely modeled after breast milk as possible. It contains high levels of cow’s milk lactose protein which is essential for healthy growth and development during the first year of your baby’s life. This easy to digest formula contains organic lactose only. Packed full of needed carbohydrates, nutrients and vitamins that make this formula one that parents can feel great about giving to their babies. Fortified with Iron, this powder is completely pesticide and herbicide free. It contains no human growth hormone or added colors, preservatives or pesticides. Feel safe about giving your baby a formula with only the best ingredients in nature. It does contain the vital building blocks for healthy brain and eye development with the inclusion for the DHA and ARA fatty acids. As a leading provider of organic formulas, Plum Organics help support the organic farming industry. Their ingredients are all certified by the USDA to contain only the finest and purest organic products. This is a wonderful nutritionally balanced kosher and gluten free option for your baby to fit your lifestyle. 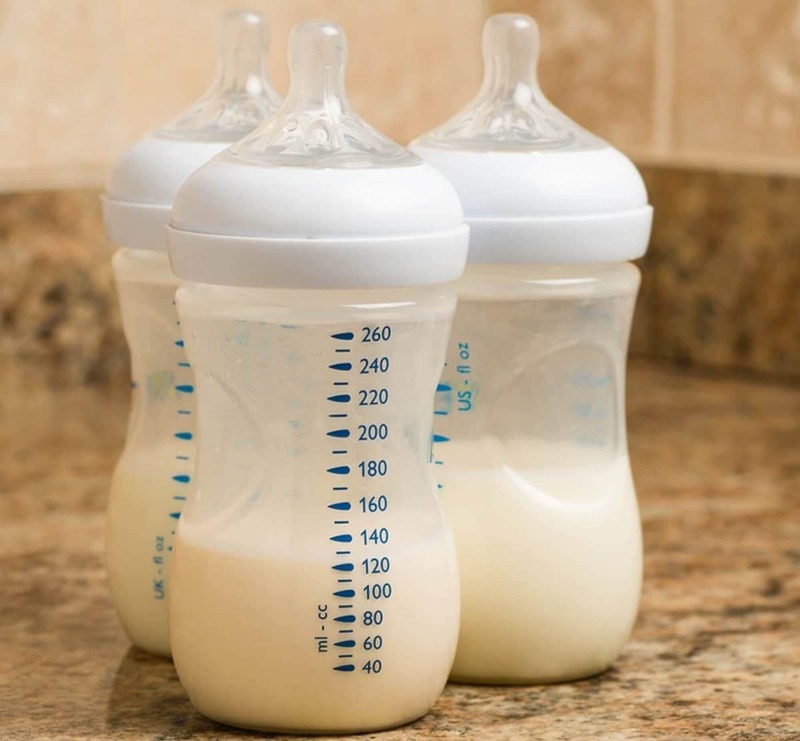 Parents have found that babies adapt to the switch from breast milk to formula much more quickly when using this product. It doesn’t cause any excessive gas resulting in fussy unhappy baby. Why we like it: Fully nutritional value formula option for families with organic diets that can feed your baby for the full first year. 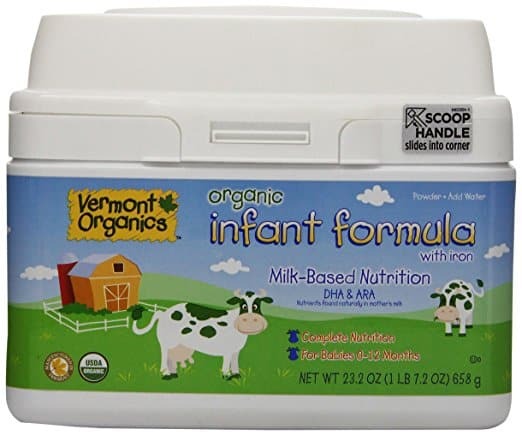 This nutrient rich organic formula from Vermont Organics provides the highest level of nutrition for growing babies. It is easy to digest and parents have found that the switch from breast milk to formula has gone very smoothly while using this product. For families that are concerned about added ingredients and chemicals, this is a perfect and safe choice for your baby. Enriched with Iron and Calcium, this organic formula contains vital Omega fatty acids including DHA, Choline and ARA. These are the essential building blocks that support healthy brain and eye development in your little one. All the ingredients are Non-GMO and certified Organic. For families that are already living a vegan or organic lifestyle, this is an excellent option to pass on to your children. There are no preservatives, pesticides, growth hormones or antibiotics in this formula, so you can be assured that your baby is only getting the very purest ingredients. The organic formula is easily digestable for developing tummies which eliminates a lot of fussing and gassiness keeping your baby happier. The parent friendly packaging is easy to open with just one hand which is a valuable bonus for parents who often need more than the two hands they already have. A built in scoop allows you to get the perfect amount of formula for mixing every time. The scoop is specially built in to the side of the container so that it won’t get buried down in the formula. 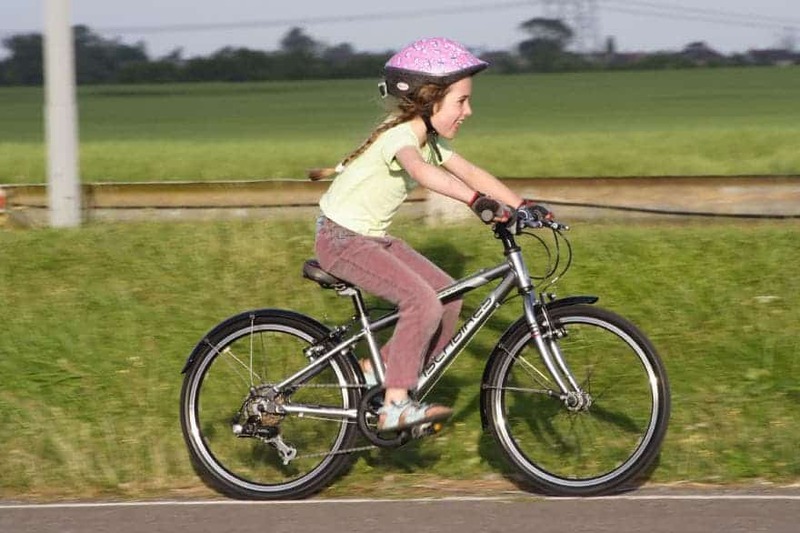 These small conveniences can sometimes make a world of difference for parents. Why we like it: This is the only available formula that includes HMO – a immune nourishing prebiotic. 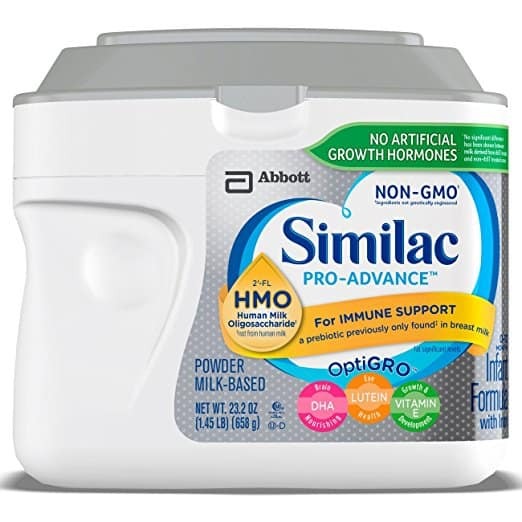 The Similac Pro-Advance Non-GMO formula is the #1 Mom’s Choice and the most used formula in hospitals. It contains excellent levels of nutrition that will support healthy growth and development in your baby through the first year. This milk based protein formula is also available in a soy mixture for babies that have issues with lactose or allergies. This is the only brand of formula that contains 2’-FL HMO, an immunity boosting probiotic that can only be found in breastmilk. The gap that can be found between breastfeeding and formula feeding is narrowed with this product that is the closest match to a mother’s milk. The Similac Optigrow formula contains healthy levels of DHA, Lutein and Vitamin E to promote excellent brain, eye and bone development. There are no growth hormones in this formula and all it’s ingredients are tested to contain only the highest levels of nutrition. By developing a strong immune system in your baby, you are protecting them in the most critical stage of their development. The presence of the 2’-FL HMO probiotic is a step ahead of other products in keeping babies safe from infection and viruses. For the parents convenience, this formula comes in a choice of powder or Ready to Use formats. When making the transition from breast milk to formula, parents agree that this product was easy to integrate into their baby’s routine. Can only be shipping inside the U.S.
For many parents of newborns, there can be a high level of anxiety that comes with the desire to provide only the best products for their babies. Science is still unable to fully replicate the undeniable benefits of breast milk but it is coming closer every day. Many parents that are starting the transition to formula feeding can be overwhelmed by the sheer options that are available on the market. Knowing the facts about formulas and the ingredients that will be most beneficial to your baby is the best place to start. Every formula is required to meet specific nutritional guidelines, but not all products are equal. Some products are engineered to address certain infant issues like lactose intolerance, or difficulties in proper digestion. Each baby has very different needs and having all the information about your choices can make your decision a bit easier. Let’s take a look at some of the basic information about formulas. The different serving styles, formats and specific formulations. Getting to know what will work the best for your baby’s needs will save you time and headaches and help keep your baby happy. 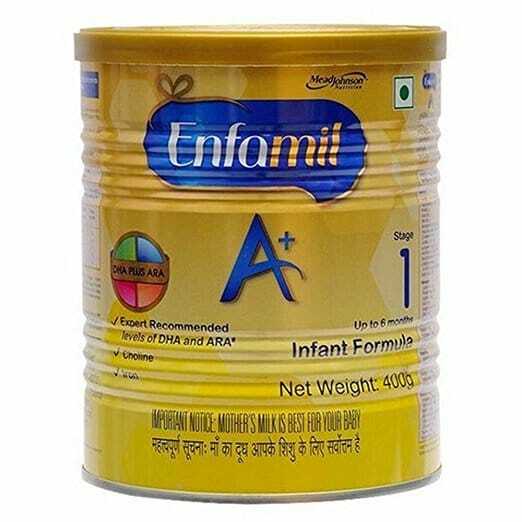 Infant formulas come in a variety of base ingredients. From cow’s milk to lactose free mixtures there are several options to choose from. Most babies are content with a cow’s milk formula, however, the following options are also available to meet the specific needs of your baby and lifestyle. It is important to not switch formulas too often. I your little one is having difficulty with a certain brand, talk to your doctor about the symptoms and get a recommendation as to what may work better. Having constant changes in formula can make digestion difficult and cause tolerance issues to become worse. This is the most common formulation in formulas and contains an altered milk protein that makes it easier for infants to digest without gassiness or spit ups. Powder formulas used to be the only option available to parents, but with changing times, and advanced technology, many brands come in a variety of serving options. With lifestyles that are on the go, having more choices in the preparation of formula can be a great time saver for parents. Formulas are designed to provide the closest to breast milk nutrition for your baby. Although this is generally good enough on it’s own, many brands have added certain minerals, probiotics and nutrients to enhance the benefits of their formula. Most parents want to be as prepared as possible for the arrival of their child. Stocking up on things like diapers and onesies is a great idea, but be careful not to invest too much in pre-bought formulas. It is impossible to predict what type of formula will work best for your baby. Take advantage of the samples that are given out by hospitals and find out what type of formula is already being given to your baby. Once you find a formula that works well, it’s time to shop in bulk. Powder formulas have the longest shelf life and are easy to store with no refrigeration required. 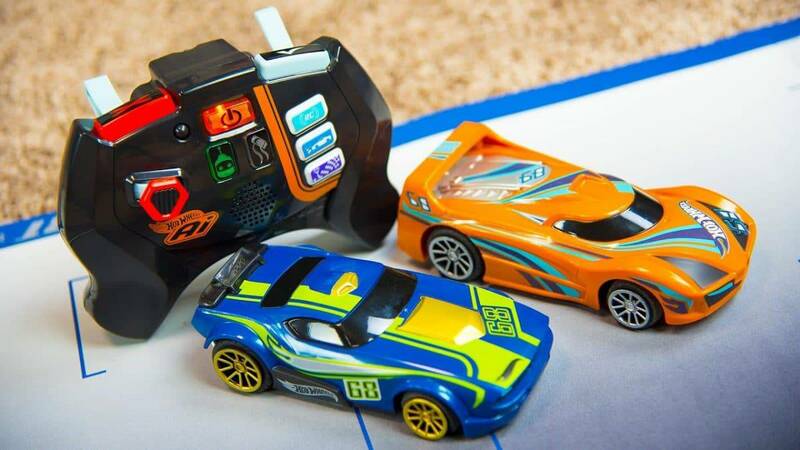 Keep an eye out for product sales and brand coupons to help you save some money. Make sure to check the dates on all of your formula. If you are buying in larger quantities, you don’t want to end up having a stockpile of formula that won’t be good for very long. Consider using a store brand of formula. Most of these options are highly recommended by parents and physicians and can help cut the costs of feeding your baby. 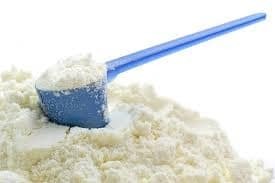 Keep in mind that milk based powder formulas are almost always the cheapest options. Many brands of formula will list directly on their packaging as to whether their product is free from BPA’s. This is a chemical that is used in manufacturing to produce the container lining. In certain conditions this lining can break down and contaminate the package contents. You are more likely to find BPA-free options in formulas that come in cardboard tins than in plastic containers. Although there are many family recipes that can be found for infant formulas, they are not recommended for regular feedings. There is no way to know if the levels of nutrition are sufficient enough to provide proper nutrition to your baby. The lack of certain nutrients and proteins in homemade formulas can potentially cause harmful effects. For first time parents and for those using formulas for the first time keep these guidelines in mind to ensure safe and proper preparation of your formula. Boil water before mixing. Bottled water is not recommended. Unfinished bottles should never be reheated or put in the refrigerator for later. If a feeding is not finished it is best to throw it out.